Dr. Sinha accepts the following list of insurance providers. Select your insurance provider to see more details. I am a gastroenterologist who performs about 200 endoscopic procedures each year, including colonoscopy, polypectomy, upper gastrointestinal endoscopy, capsule endoscopy, and percutaneous enodscopic gastrostomy tube placement. I use these procedures to help screen, diagnose, and care for people who have or are at risk for gastrointestinal cancers. In addition, I have expertise in treating non-cancerous motility issues — like achalasia and dysphagia — that can greatly impact a person’s quality of life. I see patients at Memorial Sloan Kettering Monmouth in Middletown, New Jersey. My interest in medicine began when I shadowed my mom, who is a neurologist, and I saw the way that she used a hands-on approach to provide compassionate care to her patients. In college and medical school, I studied basic biology because I wanted to better understand human diseases in the context of science, and how those two things interplay. 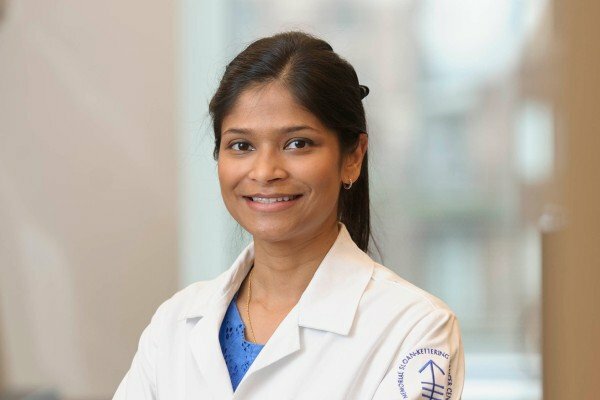 I ultimately chose gastroenterology because it allows me to use my understanding of basic biology to help advance the tools we have to treat patients’ diseases, and to interact with them on a personal level. Understanding the biology of cancers has allowed us to make advances in how we diagnose and treat them, including pancreatic cancer, which is where my research focus lies. In the past, I have studied the unique interaction between nerves of the tumor microenvironment and pancreatic cancer in order to develop new targets for treatments. Moving forward, my research will take a clinical focus: I will investigate new ways to manage pancreatic cysts, and I will be part of a clinical trial to assess chemoprevention — taking agents to prevent or delay the onset of disease — for pancreatic cancer. Many people who come to see me are at a higher risk for gastrointestinal cancers, such as colon cancer, and are anxious about the outcomes of their screening test. I also see people who have been treated for cancer and are worried about their disease recurring, or the possibility of developing a second cancer. Because of the tools available to me and the level of expertise of my team, I am able to reassure my patients that we will address any issues immediately and thoroughly. Furthermore, I am interested in taking care of people who may suffer from side effects of treatments for their cancer, including chronic diarrhea. To help these people, I provide a detailed work-up and tailored management of their symptoms to get them feeling better as soon as possible. As a member of the MSK Monmouth team, I am able to offer my patients the same equipment, procedures, and high standard of care closer to home in New Jersey. I enjoy being able to provide streamlined care to the people of Monmouth County, while building relationships with community members. When I’m not working, I enjoy cooking, meditating, and spending time with my family. Visit PubMed for a full listing of Dr. Sinha’s journal articles. Pubmed is an online index of research papers and other articles from the US National Library of Medicine and the National Institutes of Health.